Learning a pressure cooker, or in my case, an electric pressure cooker (brand Instant Pot) means trying out new recipes and seeing what it can do. In the case of chicken noodle soup, the answer is a whole hell of a lot. When I made it, I went online to see what the general suggestions, and recipe directions/ingredients are for chicken noodle soup. The best suggestion, which I heeded, was to cook the noodles separately because of the difference in required cooking time. Other included cubing the chicken before cooking it (for people using boneless chicken breasts or thighs) and suggestions on how much broth and water to include in the pot. Finally, I was reminded that cooking bone-in chicken means leftovers will be a little gelatinous, from the natural binders in the chicken cartilage. Chicken noodle soup made (mostly) in an electric pressure cooker (Instant Pot). Bone-in skin-on chicken legs were used, as well as green chiles (Anaheim peppers). I didn’t see any particular instructions on what to do with chicken legs. Chicken legs are probably the cheapest meat I can get and when I went to the store to get ingredients, they were only $1 a pound, by far the best deal in the store. They also go on sale for $4 for a 10 lb frozen bag. 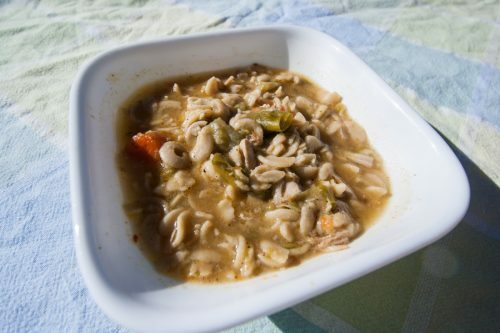 If you’re looking for a cheap chicken soup, this is it. I put the metal steam rack in the bottom, put in two chicken legs, the cut veggies (squash, zucchini, carrots and green chiles), poured in six cups (32 ounces) of chicken broth, a little water, half a bullion cube, locked the lid and turned it to 15 minutes . After it finished cooking, and I allowed it to “natural release” for 15 minutes, I vented the unit and extracted the first chicken leg with a gloved hand and started taking the meat off the bone and putting into a bowl. Once both chicken legs has been stripped of their meat, I threw them back in the pot and started stirring. Meanwhile, I already drained the pasta and, after realizing everything would be easier in a larger pot, I transferred everything to the pot the pasta had been in. I added the noodles and realized it lacked salt, so, remembering a Cook’s Illustrated I read on the topic, I grabbed my trusty light soy sauce, my trustier fish sauce and seasoned the soup. Unfortunately, for leftovers, the pasta continued to soak up the broth. I was fine with it, but one could have added a little more. Chicken legs or (bone-in) thighs work just fine, so long as you’re willing to fish them out, strip the meat off the bones and put it back in the pot. 2-5 green chiles (Anaheim peppers) or other peppers of choice, such as bell peppers or Poblanos. 1. Cut all the vegetables into bite-sized pieces. 2. Place the steamer rack at the bottom of the (electric) pressure cooker, then place the chicken legs on top. 3. 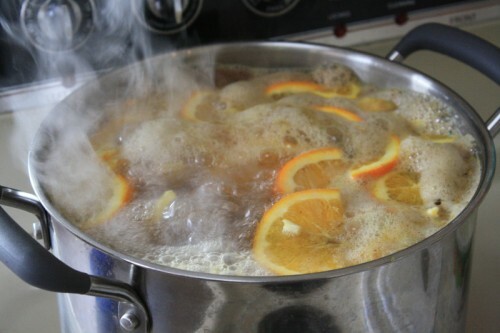 Put the vegetables in the pot, followed by the chicken stock, the bullion cube (if using) and the water. 4. (Electric) Set the pressure cooker for 15 minutes. Allow for 15 minutes of natural release, and then vent, if desired. If using a stove top pressure cooker, bring to pressure and cook for 15 minutes. 5. While the soup is cooking, in a medium pot, heat water to boiling. Salt the water, then add the noodles and cook as per directions. 6. Once the soup is vented, or the top can be opened, remove one chicken leg at a time and, being careful not to burn your fingers, with a fork, knife or both, remove the meat from the chicken bones. Cut the meat into the desired-sized pieces. Continue with the rest of the chicken legs. Add the meat back to the soup. 7. Drain the pasta and combine with the chicken soup. If desired, transfer the soup from the pressure cooker to the pasta-cooking pot. 8. Season with soy sauce and fish sauce, until soup reaches desired saltiness. 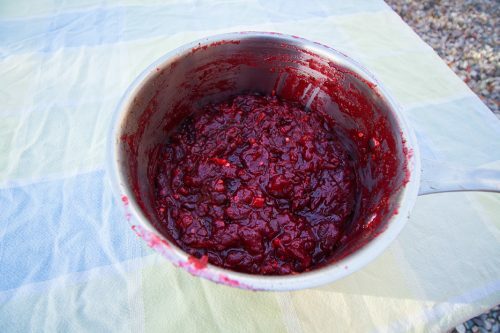 Cranberry sauce (or relish) is usually a dish reserved for Thanksgiving, Christmas and any other time you’re serving a turkey. Whatever the occasion, cranberry sauce is one of the dishes you should make before before roasting the turkey, along with stuffing and most of the gravy. 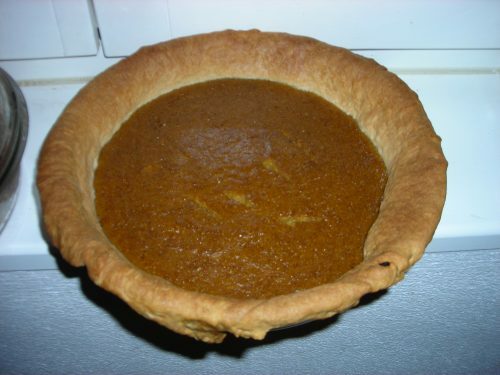 Now, before you entirely discount this recipe, I can attest that it was one of the biggest hits from Thanksgiving 2017. The fact that spice is a part of what would normally be a sweet dish adds some to the allure. It’s also very easy, although how cheap depends on if you can get cranberries on sale. It’s mostly about the taste, but somewhat about the presentation. It’s essentially your regular cranberry sauce recipe (which will gel in the refrigerator) with the addition of lemon and lime juice, a little ginger and some jalapeños. Whenever someone asks, “What’s a healthy recipe that’s easy and I can snack on?” I have a stock reply. Hummus. 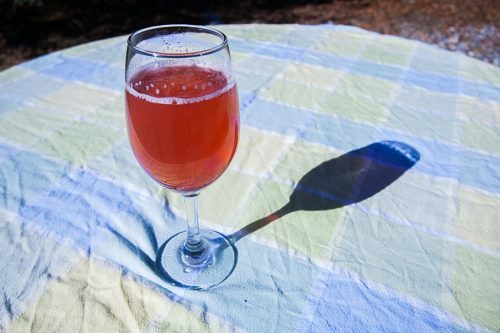 (See just the recipe here). It’s easy, it’s healthy, it’s delicious and it can go with vegetables, bread, with other sauces, or be served as a spread. So, what is hummus and why should you make it at home? Hummus is a mix of cooked and crushed chickpeas, also called garbanzo beans, with tahini, also known as sesame seed paste. 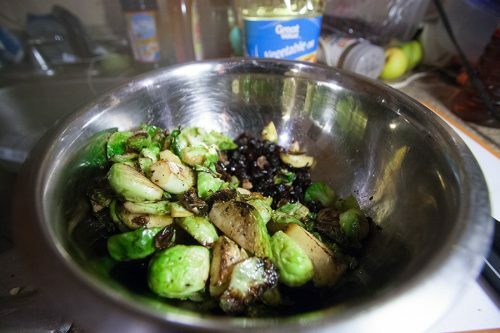 There are some other ingredients: lemon juice and salt, as well as a host of optional ingredients including garlic, peppers, artichoke hearts and other seasonings. Mainly though, it’s just cooked chickpeas and tahini, blended together. 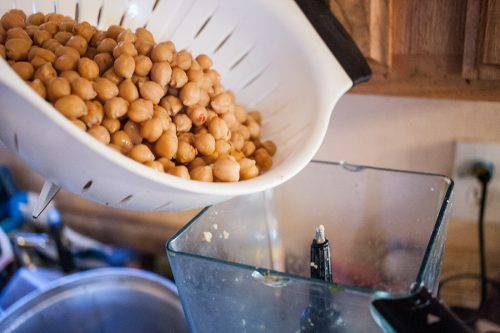 Things can get a little bit more complicated if you’re willing to take the extra step (frugal and healthy) of cooking the chickpeas yourself. Even then, hummus is a super simple recipe. Adding the chickpeas to the blender. Normally, stores sell 8-16 ounces of hummus for $3 to $8. You need eight ounces of tahini for this recipe which sells for $3. The pound of dried chickpeas is another dollar. 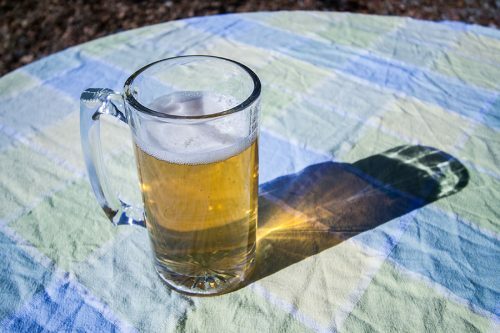 It makes a full 72-ounce blenderfull, which is a decent return on investment. 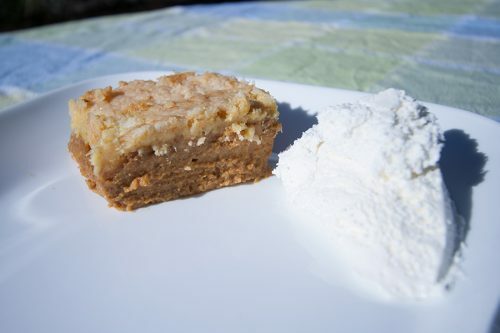 Find the stand-alone recipe here. Sometimes, great things come from the lowly grill at your local gas station. That is the case with the corned beef hash burrito, originally hailing from the Triple S gas station in Española. Uniquely New Mexican and a delicious fusion, there is nothing quite like it. I was first introduced to this fusion by a co-worker who announced to the newsroom that he was going to get one at the gas station. Soon, I went to discover this invention myself. I can vouch: it’s amazing. Here in New Mexico, you will always be asked if you want red, green, or nothing. This refers to green chile and red chile. If you want both, it’s called Christmas. This version leaves the chile choices up to you. I decided to chop up and lightly cook a green chile for the burrito. Normally I would have paired it with salsa and the secret sauce I use for grilled corn and fish tacos, but I was out of both. There are quite a few moving parts to this recipe. First, the corned beef hash. I used the canned kind because I haven’t made corned beef in a while. 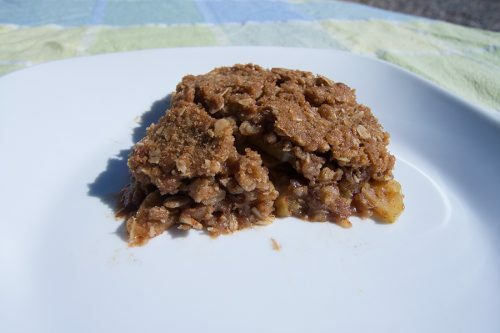 If I had, the hash is pretty easy to make. 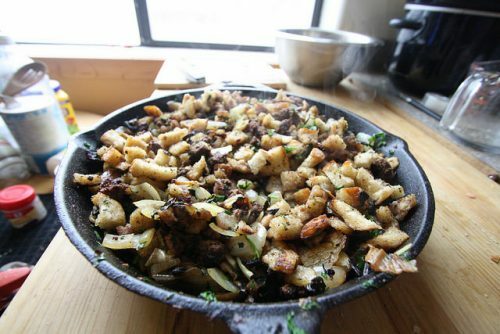 Finely dice everything (cabbage, potatoes, corned beef) and throw it in the skillet to fry up. Either way, it fries in the skillet. Next are the diced potatoes, which are optional. Since I now have an InstantPot, the brand name for a type of electric pressure cooker, I cooked the potatoes the night before. 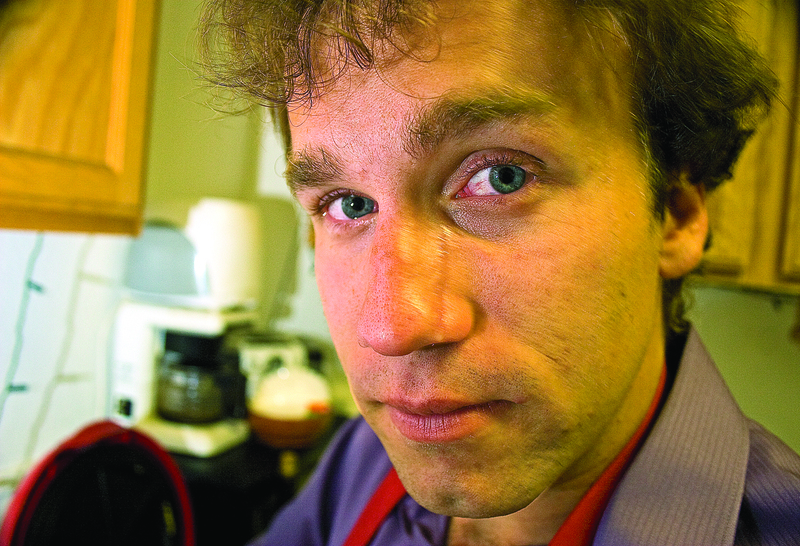 First, I cooked them for five minutes, which left them a little too hard. I cooked them again for two minutes, which made them a little too soft. The next morning, I diced a few of them, then threw them in a skillet with some oil, salted liberally, and let them fry. Zhug, after the cilantro and jalapenos and citrus and salt have been blended together. Ready for some fiery consumption. Cilantro certainly plays a second fiddle, in salsa, as do tomatoes, but still: chile, cilantro, these are the building blocks of many New Mexican meals. So, what does that have to do with zhug? Well, combine those two things into one dish. Blew your mind, didn’t it? Chile and cilantro are not the sole property of New Mexican cuisine and lots of other cultures do complimentary things with them that I think we should all copy, or at least, pay attention to. That New Mexico can learn a lot from other parts of the world, including from the middle-east, where zhug originated. It can either be described as a cilantro-based hot sauce (and, depending on how you make it, I mean Hot) or as chile and cilantro pesto. Take your pick. I prefer the former, partially because I make mine scalding. It’s a very simple sauce. Put cilantro, lemon juice, lime juice and, important here, peppers, into a blender. Blend. Blend, blend, blend. That’s it. Maybe add some salt, to taste. And you’re done. 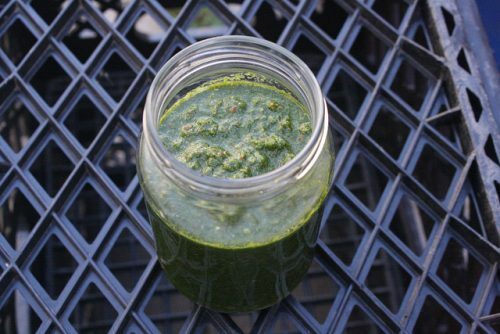 It’s a pesto-like hot sauce or a hot pesto. Either way, zhug goes well with pita bread and tabbouleh, with some hummus. Maybe you’re going to make zucchini fritters. 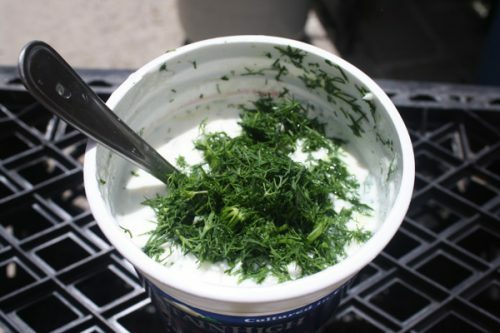 Add some on the side, along with tzatziki. I should add, this sauce is very dear to my heart. Being such a fan of cilantro, even naming my blog after a proclivity for it, I gotta say. We all should love zhug. 1. Chop the cilantro, peppers and garlic. 2. Put all the ingredients, sans salt, in a food processor or blender. 3. Blend until it reaches desired consistency. 4. Add a small amount of salt, to taste. If you want the full gallery of full-quality photos, they are licensed under a Creative Commons 2.0 Attribution-only license. See them here. 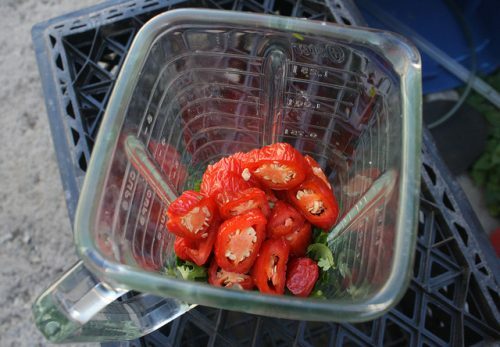 Jalapenos in a blender, before being blended, to make Zhug. Add liquid (lemon/lime juice) to aid in the blending process. 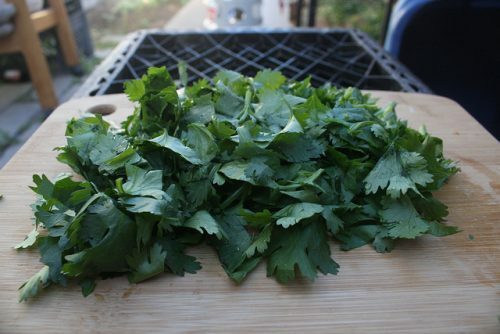 Cilantro, being being chopped up and put in a blender to make Zhug. 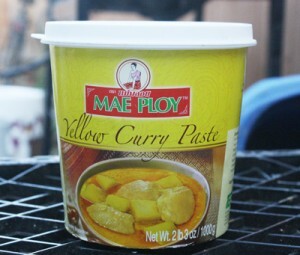 I’ve been a fan of curry pastes for a long time, as well as a fan of buying ingredients in bulk for cost savings. I don’t just buy curry pastes in bulk. Potatoes, too, as well as chicken thighs when there’s a big sale. Somehow, and I don’t know how, I alighted on the idea to combine all three of these things. It may have started with pan-fried potatoes, or maybe with oven baked chicken thighs (skin on, bone in). It may have its genesis in yellow curry fried rice, where I first learned that the (Thai) curry paste works incredibly well as a seasoning. 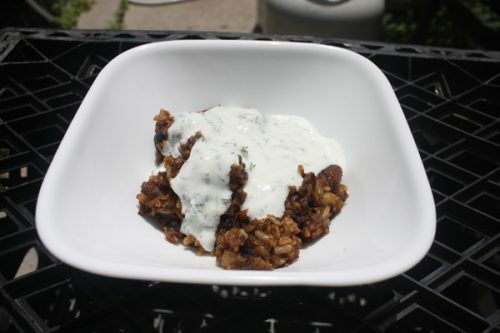 Before I go any further, I need to mention that this dish goes really well with at least tzatziki, and probably zhug as well. Irregardless of how it happened, I then used yellow curry paste (the mildest of the pastes) as a seasoning for pan fried potatoes. All of this is being done in a cast-iron skillet, of course. Finally, I decided that the best of all worlds is to put the chicken thighs on top of the potatoes, and maybe a few other vegetables and then bake to allow the juices and fat to seep into the potatoes, mingling the flavors. The problem with chicken thighs is they take a long time to cook at a high temperature. It’s not so much a problem as something you need to be aware of going into the cooking process. Having made rice bowls the night before, I had lots of leftover rice. (Part and parcel of making rice bowls is leftover rice, to either be used in future bowls or in other dishes). Finished spam, rice and (scrambled) eggs. Furikake is on the top of the sushi, or vinegared, rice. 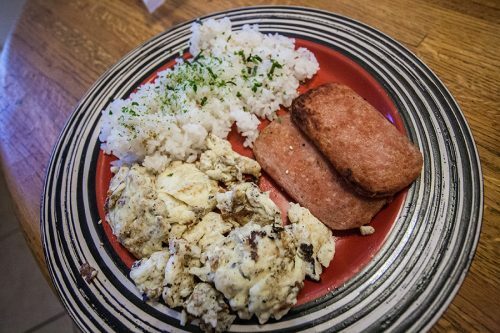 That meant, this morning, it was time to fry up some spam, cook some eggs in the spam fat and heat up that leftover rice to make a (modern) Hawaiian classic, spam, eggs and rice. Now, a close relative of this is the spam musubi. 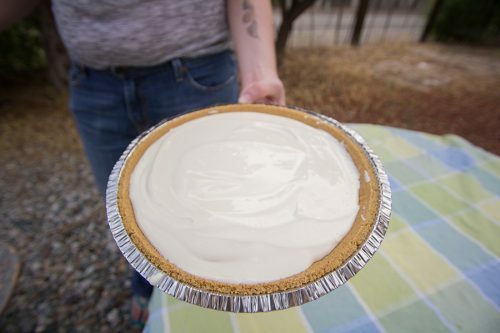 I wrote about it for the Rio Grande SUN (no link since the columns don’t make it to the website) but I did post the recipe here. Many people, including the people I work with, cast aspersions on the very idea of spam, or scoff, or express their pure disgust at the idea. Then again, lots of people are scared of lots of things, and if you weren’t put off by the article title, I hope you will keep reading. Spam, rice and eggs is so ubiquitous in Hawaii that it’s even sold at McDonald’s, part of their breakfast menu. That also indicates what kind of a breakfast it’s going to be. But, never fear. Much like the rice bowl, you can easily add veggies to the top of your rice to make it a more balanced meal. Spam, rice and eggs is so simple, almost dead simple. 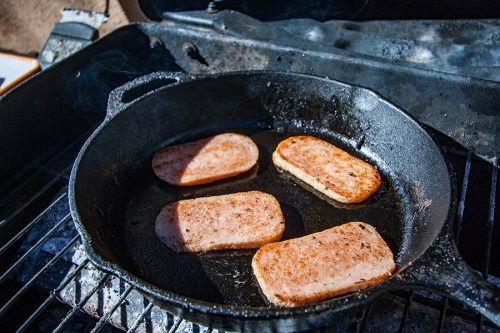 Simply cut a couple of pieces off of the spam log, fry them up in a pan, heat up some leftover sushi or vinegared rice (you can also use normal steamed rice, fresh or leftover) and cook a couple of eggs in that same pan, either fried or scrambled. Put some furikake (Japanese seasoning made with seaweed, among other things) on the rice, maybe cut up a few veggies to put over the rice and there, you have it. Spam, rice and eggs. Simple, wasn’t it? Next up, according to my thinking? Spam, (sushi) rice and eggs in a burrito. New Mexican and Hawaiian fusion, all the way. See the full set of photos (see below) on Flickr. All the photos are released under a Creative Commons Attribution Only (2.0) license. If using fresh rice, make it now. I suggest making sushi/vinegared rice, either fresh or left over. 1. Heat a large pan over medium-high heat. 2. 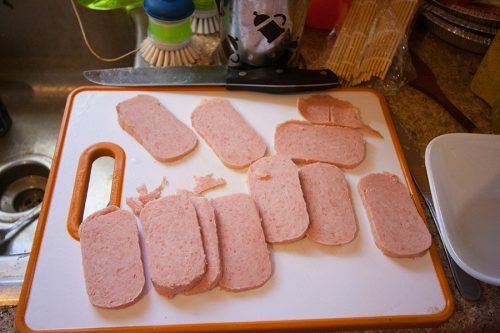 Take the spam out of its package and slice into 1/4 inch slices. 5. Prepare eggs for scrambling, if cooking that way, including mixing and adding milk. 6. Cook the eggs as desired. 7. 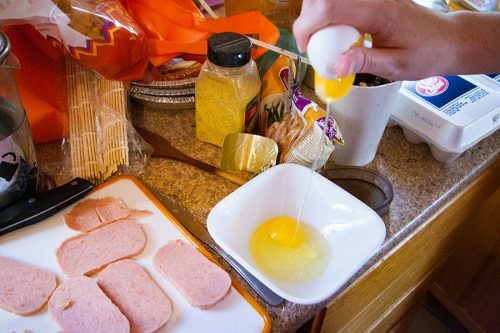 Serve the spam with the rice and eggs. Spam cut into slices before it goes into the skillet for some light browning. 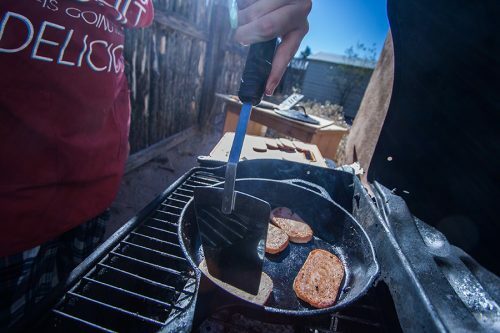 The spam has pan fried up nicely. Just a little brown. I cook on the grill because it doesn’t make the house smell. 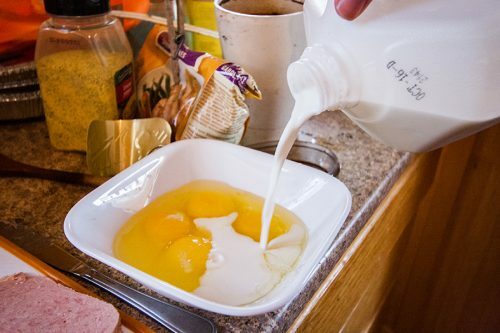 Pouring milk into the eggs before everything is mixed. Scrambled eggs, this time. That’s always a problem, right? Pasta, or . . . What else is in the kitchen? Refrigerator? And the time factor? Do I need to go to the store? In my house, there are a few things always on hand: vegetables, maybe some meat (leftover, marinated or unprepared), always uncooked rice (and often times, leftover sushi/vinegared rice, plain recipe). For me, the easiest meal is often times the humble rice bowl. I cook up some rice in my rice cooker, I turn it into sushi/vinegared rice (blog post). Then, do I want to make sushi? Or a rice bowl? Or maybe onigiri? Or maybe, a few sushi rolls now and rice bowls for lunch tomorrow, and some onigiri (rice balls) for later? The options are endless. 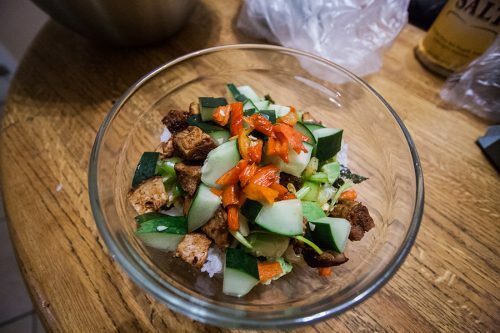 Peppers, grilled chicken, cucumbers and seaweed, at the very bottom, sit on top of rice in this rice bowl. So, what is the rice bowl? Well, it’s simple. 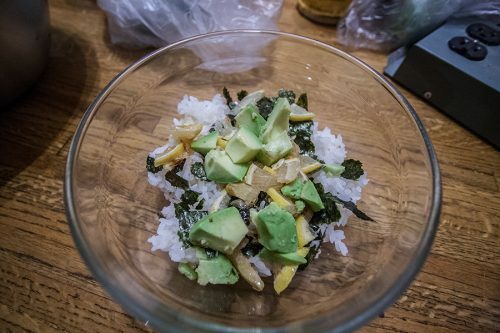 You make some vinegared/sushi rice, put it in a bowl, cut up some veggies into bite-sized pieces, maybe cook up some meat and cut it up too, then throw it all on the rice. Which veggies? Well, cucumbers are always nice, as are avocadoes. If you thinly slice, then deseed lemons, they are delicious. Being in New Mexico, I always add green chile peppers (unroasted) as well as jalepenos. Nori (seaweed) adds much needed taste. Green onions are also a good addition. What else do you have? Throw it in there! Leftover steak? Cut it up, throw it in. Same goes for chicken, pork, or other meats. Bam! You’ve got a simple, relatively healthy dinner. Veggies, a little meat. Sure, the rice isn’t particularly healthy, but it’s frugal. Very, very frugal. Avocados! Taste delicious in rice bowls, as do lemons. Seaweed is also a must. There you go. Rice bowls. Simple. Delicious. Easy. 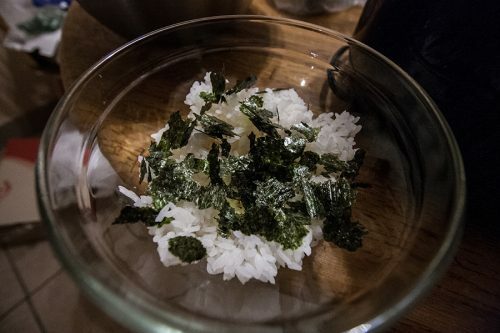 Seaweed (nori) is the first thing to go on top of the rice. See all the photos on Flickr, in high quality. Realized you don’t know how to make sushi rice? Here’s the recipe. Want just the rice bowls recipe? Right here. 1. Cut up the vegetables into bite-sized pieces. Cut the lemon slices into quarters. 2. Put enough rice into the bottom of a bowl. 3. Tear up the nori and place on top of the rice. 4. Put the cut up vegetables and meat, if using, on top of the nori, which is on top of the rice. 6. Add condiments over the top and enjoy.